Proudly serving South Central Pennsylvania and Northern Maryland, including Adams, Lancaster and York Counties, as well as Baltimore, Carroll and Harford Counties. Web Only Offers from Your Mid-Atlantic Culligan Dealers! 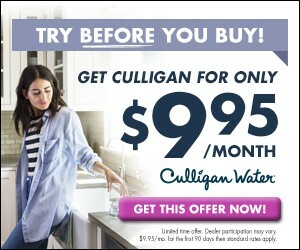 From Ridgeway to Wexford, our Web Only specials are the ideal way to put Culligan to work in your home! The purest water straight from your tap for less than $10 a month! Sustainability -- ditch your disposable water bottles for good! Cost savings on detergents, laundry, and appliance life -- up to 50%! Affordability -- simple, low-interest financing available. Maintenance-free -- your local Culligan man will handle everything, from custom installation to filter changes! * $9.95 a month for the first 3 months, then standard rates apply. Credit restrictions may apply. Contact your local dealer for details. **Contaminants may not be in your water.